The body were attending the PGA merchandise show in Orlando and we were delighted to step in to help finish of their stand display for the show. Not a big part of the stand we have to say but Plan B quickly turned around the graphics required for each of the participating members to ensure that the stand's branding was continuous. The overall stand was we think put toegther by VisitScotland in conjunction with the GTS team and it certainly gives a very positive impression. Speaking at the event, GTS chairman Lee Derrick said, “The PGA Show is one of the main golf industry events of the year and an important showcase for Scottish golf tourism businesses. This year we took more stand space than ever before and created a presence that truly reflected the quality ofScotland’s golf offering. The feedback from our stand partners has been positive and this week could generate thousands of pounds’ worth of business for the sector." GTS was joined by 10 partner organisations representing a broad spectrum of Scotland’s golf industry, including golf resorts, tour operators, hotels and industry groups. 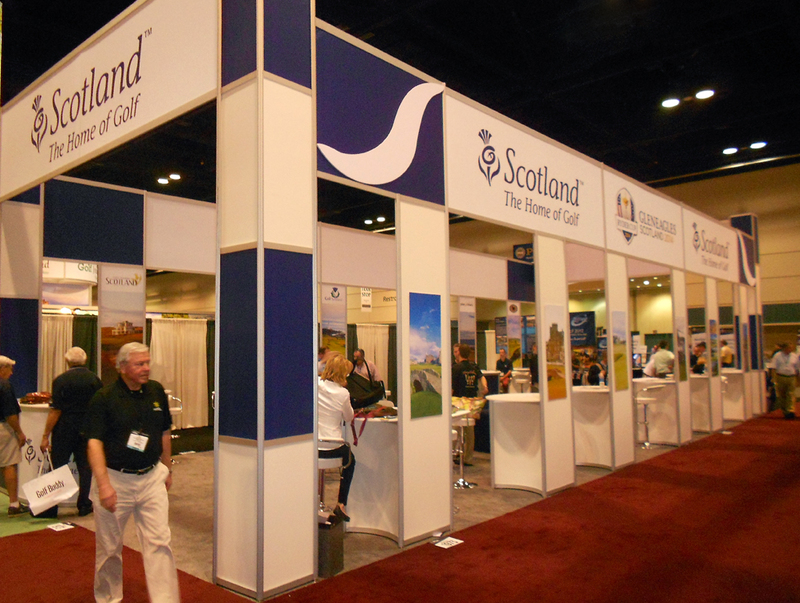 The consortium was the largest ever assembled to representScotlandat the annual PGA Show. As well as manning the prominent exhibition stand, delegates also attended a Scottish golf day prior to the show which attracted around 70 leading industry figures and golf journalists. The Scottish contingent included Andy Burgess, head of operations and development at Meldrum House, who picked up the 2011 GTS Gold Standard award for Country House Hotel of the Year. You can find out more about Golf Tourism Scotland on their current website - new one due out April 2012! Not a big part of the stand we have to say but we quickly turned around the graphics required for each of the participating members to ensure that the stand's branding was continuous. The overall stand was we think put toegther by VisitScotland in conjucntion with the GTS team and it certainly gives a very positive impression. It’s been a busy few weeks for the team at Plan B with a number of new clients coming on board to take advantage of their newly launched Open Rooms MM12 website packages. The Open Rooms packages were created and built around the needs of small hotels, guest houses, B and B’s and self-catering operations and are integrated fully with the award winning Bookassist Booking Engine. Based on an ever expanding series of template strictures each site is then given a full make over which transforms the template into a bespoke designed fully content managed website with online booking from the start. Emma and Tom at North Berwick Golf Lodge had used the team at Plan B previously to do some painless work on improving the content and search engine tags for their exclusive use property in East Lothian – a project that according to Emma had quite dramatically increased the targeted traffic through the site – and as a result had turned to them again when they needed a new website for their recently acquired Bed and Breakfast property. The Open Rooms Lite package was perfect for the property; easy to manage and update and from outline discussion to completion was less than four weeks. Plan B dealt with not only the site design and content but the hosting, domain name registrations and all of the uploading and set up of emails and were delighted with the results. One of the most critical pieces of the jigsaw in the Open Rooms suite is the online booking engine. A website must look good, it must have relevant content for customers and search engines but importantly it must also be able to convert. All the Open Rooms packages have been designed to fully integrate with the Bookassist Booking Engine and seamlessly move the customer from Awareness to Action. The uploading of the room availability and training for the owners was done within forty eight hours and the site was launched within two weeks of being discussed and took its first direct online booking in the first 48 hours! Emma Hill is delighted with the results, “Thanks to Ian and Stephen at Plan B, we now have a newly designed website which ideal for our businesses. All we had to do was choose our template and forward text and photos, etc. The rest was all completed for us. The new site is easy for us to manage ourselves, we can make changes whenever is required. Plan B have also been working hard at maximising our online activity. We are also pleased to have the facility of the online bookings. Not all clients' want to pick up a phone or e-mail to make a booking, so there is more flexibility in that they can book directly online. I noticed in last week's Sunday papers that the contents of Blair House in Ayrshire were being sold - bit of a shock as I hadn't heard it was even up for sale. A quick Google search found an open letter from the Borwick's. I have to say that it is a great shame that the property is changing hands after so long in the family. I was also then going to say that it had always been a great venue for meetings and exclusive use but perhaps again highlights that it would be a loss to Ayrshire's hospitality portfolio. However a quick phone call to Blair put me right! Caroline Borwick advises that they will be staying on in the grounds and that the new owners, Energy Minister Charles Hendry and his wife Sally who bought the property for £2.5 million late last year will be continuing to market the business. According to an interview in The Telegraph in November, "The Conservative energy minister and his wife, Sallie, whose first husband was a member of the Moores family that once owned the Littlewoods Pools empire, have spent up to £2.5 million on Blair Castle in Ayrshire. So there we go, not all as bad as we thought and means there's now a couple of more Tories in North Ayrshire! Regradless, our best wishes go to Caroline and Luke Borwick who were always the most engaging of company. Sometimes things work out okay after all - in spite of our best efforts to screw them up!. 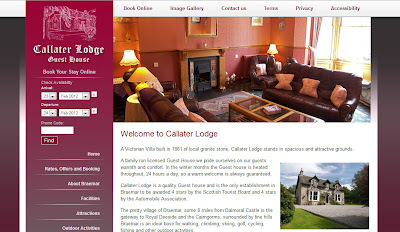 We were asked to present at a workshop in Boat of Garten in the autumn of last year about online reservations and increasing website conversion. Being a little smart, I thought we’d do something slightly different and use a linked image gallery to make the presentation instead of a tried and trusted and frequently amended PowerPoint presentation. Did it work? Did it hell! The feedback reviews for our presentation were the lowest I think we’d ever received and lagged well behind the other speakers. Tail between our legs and lesson well learned. However out of it did come a few very good follow ups and one of these lead finally to the launch of a new website for a fantastic Guest House in Braemar – Callater Lodge. 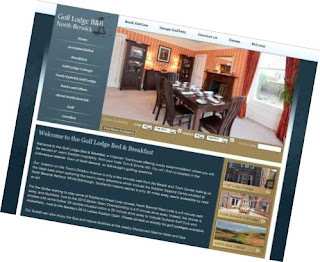 I say finally because when Andy at Callater Lodge called us we were just in final testing of the new Content Management System which we using to drive our new suite of Open Rooms MM12 website packages for accommodation providers. “Final Testing” does cover a multitude of descriptions however and as a result the site did take a few week longer to complete than it should have done. However it is now live with what we think is a more contemporary slant on the Highland hospitality website featuring some great images and most importantly good content. The site also utilises the functions of the Bookassist Booking Engine with fully integrated room reservations in the website (not linking out) and the same availability is also shown live in real time on the Guest House’s own Facebook page. The Open Rooms MM12 packages were created and built around the needs of small hotels, guest houses, B&B’s and self-catering operations and are integrated fully with the award winning Bookassist Booking Engine. Andy Shore from Callater Lodge gave his view on the process, “I went to the meeting in Boat of Garten with a view to gaining knowledge about new technology, booking engines and mobile applications. Ian is right actually; his presentation wasn’t the best! But after chatting with him one to one it was clear his enthusiasm, knowledge and commitment to help was all there. I had no hesitation in enlisting Plan B to design our new website and integrated booking system. As Ian has mentioned there have been a few hiccups along the way but as with any new system that was not unexpected. We now have what we think is a great working website and online booking system, which is already proving its worth. 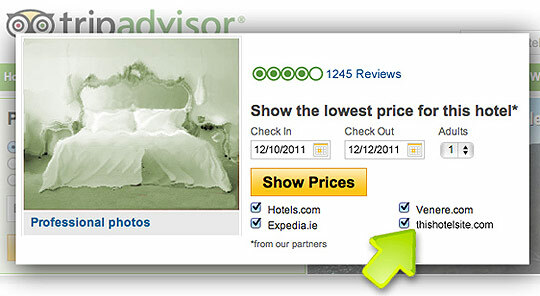 Is TripAdvisor Cost Per Click For You? We recently published an article about the opportunity that Bookassist clients in Scotland have to compete with the online travels agents to buy direct clicks from TripAdvisor reveiews. The full article is linked at the foot of the page but here are the conclusions they drew - we're not sure that we would disagree with any of them to be honest. So what is the key point in the decision making processes about whether to invest in Tripadvisor’s PPC program? 1. As a prerequisite, and as for any investment that will bring traffic to your official website, make sure that it is optimized to convert, offering the potential client the best experience regarding design, reservation engine, rates and also enough room availability. 2. High cost: 25-45% (again, this is related to your position). Compare it with other channels and decide whether the same investment would offer you a better return by other means. If you totally bet on your official website (which will probably collide with intermediation), the costs will be lower. Think that Tripadvisor is enabling the user to compare the rates, so even if the rate is not the only thing to take into consideration, the fact is that Tripadvisor really focuses on it. 3. Limited expenses control: Tripadvisor’s CPC Program doesn’t currently offer any control for the hotelier regarding the amount to invest because it doesn’t manage every account separately but rather in a global way along with other hotels. If you require to budget or control your cost in advance, this could be a problem for you. We hope this changes soon, but nowadays, you will be told the amount you invested by the end of the month instead of at the beginning. 4. The better your hotel’s position is within the pages of your destination, the more chances you will have to receive reservations by this means. Without a good position, it is even possible that you spend your money without getting any reservation at all. 5. It is better if your average reservation value is high. This will soften the fixed cost that involves the “pay per click” concept. 6. If you don’t participate directly, you will be feeding your intermediaries. Check out which of them are bidding. Paying 18%-25% in intermediation means that they are using a part of the incomes to bid in Tripadvisor, which would explain the current phenomenon: “booking/venere/expedia are selling more and more”. They are not going to pull out of the race, even if they pay the same or even more than you, so having a direct presence also comprises a political dimension that you should take into consideration. 7. Satisfy your clients. Life smiles at hotels that do so, and this test confirms it. The new ways of distribution that are arising, such as, Business Listing, and the social network, etc., need happy clients to work. Without their satisfaction, you’re out. Tripadvisor’s CPC, whose return is very sensitive to your ranking position within your city, is a materialised and quantifiable example of this trend of which everyone talks about abstractedly. 8. Trial and error. If you are in doubt, you’d better try it and see the numbers you get. No matter how far we take our analysis: every hotel is different from the rest and there is no way of checking whether this works for you other than trying it. The following article was first published on their own blog by Bookassist's Ciaran Rowe who talks about the recent introduction of Google Search plus your World and its impact on the search results page. Google recently announced the launch of a new feature on their search results pages, called Google “Search plus your World” which incorporates results from the user's Google+ network in addition to the existing results. 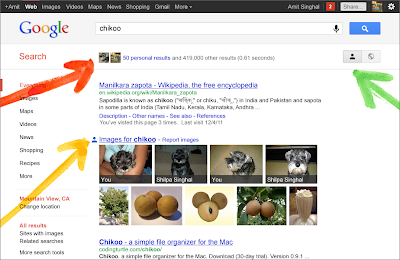 This initiative is part of Google’s efforts to include more social content in their results. Since the deal they had with Twitter has lapsed, and they are not given access to Facebook content, the obvious source of social content was their own Google+ network. Although the new look is available to users searching in English in the US, it is not available worldwide yet, but Google announced that it would be rolling out very soon. The three key changes to the page are personal results, profiles in search and profiles & pages. 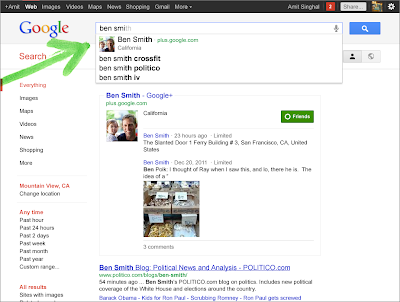 The image below, which is a sample provided by Google, shows the layout of the page with the new elements. 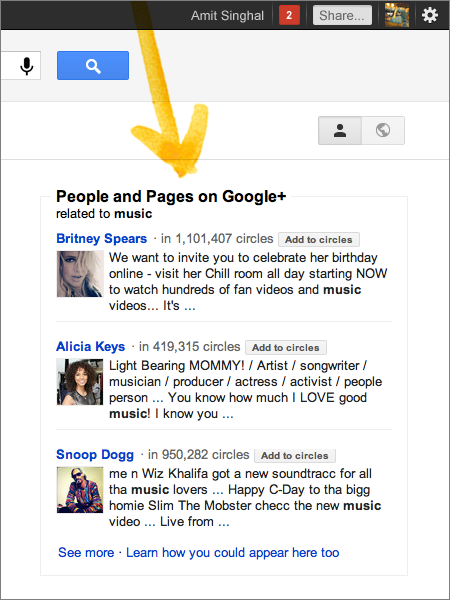 The red arrow points to personal results which are taken exclusively from content that has been shared with the user in Google+. 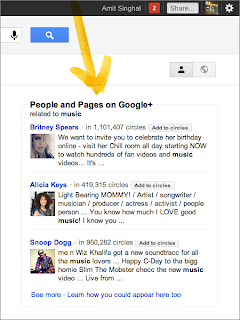 If the user clicks on this area it will expand to show the contents of the personal results from Google+. 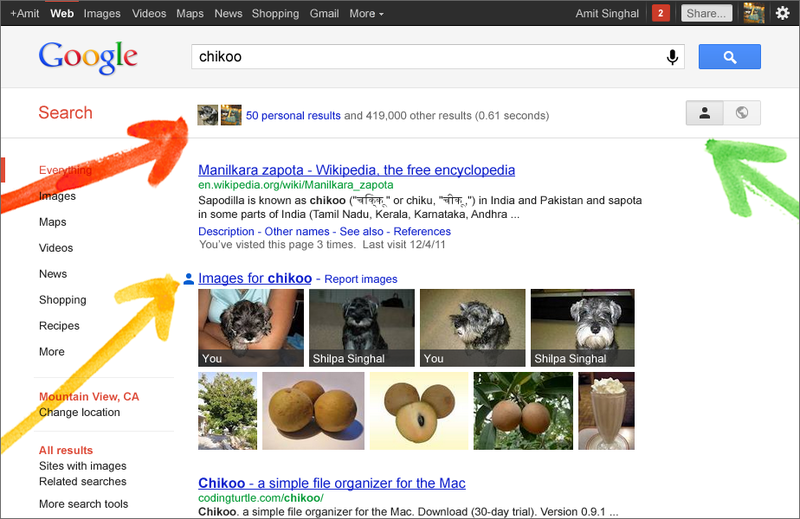 The yellow arrow points to personalised content which is embedded in the page, in this example showing photos from the users Google+ circles, related to the search query. The green arrow offers the opportunity to turn off search plus or to toggle between standard results and search plus results. This new element adds users from your circles to search results so if, for example, you start typing the name of someone in your circles, Google autosuggest will complete the name and display their content in the results. It will also show Google+ profiles related to the search results and provide a button to allow you to add them to your circles.So if, for example, you see a blog article or a news commentary that you like, you can add the author to your Google+ circles. This area allows users to connect with high profile Google+ businesses and people. In the example provided, if you search for a music related term, some high profile musicians profiles will appear on the right hand side of the page, giving you the opportunity to connect or find out more about them. Privacy - many users are concerned that the content of their Google+ pages is being shared in the results pages, but Google have emphasised that the new system is extremely secure and that content is only displayed to users that have previously had the content shared with them through their circles. An example would be, if a friend that was following posted photos of their trip to Thailand on Google+, I would see those photos in my search results if I did a search for Thailand, however, people not connected to my friend would not see his photos.The new page uses SSL encryption to ensure the security of the content when users are logged in to their account. An unfortunate side effect of this for marketing purposes, is that Google analytics no longer displays keywords that were used by visitors to your website if they are signed in. This information is now displayed as (not provided) for organic traffic, although adwords users still have access to the data for the moment. Opt in/out - there is currently no way to opt out of having your content displayed in searches by users that are in your circles, so it is important to monitor what content you share. It is possible to opt out of seeing Google search plus by adjusting your search settings once the option becomes available. This recent development emphasises the importance of creating your own Google+ business profile in order to maximise visibility in Google search. As further information becomes available, we will update this blog, so check back soon. Bookassist continues its leading online strategy development through an exciting partnership with TripAdvisor to allow our client hotels to offer a direct booking link to their hotel website from their TripAdvisor page. The new TripAdvisor Direct with Bookassist is one of the strongest third party calls to action you can avail of to drive more direct traffic to your website and generate new direct business today. With over 50 million reviews, TripAdvisor is the major source of influential user-generated content online and generates significant referral business for any hotel. When a visitor views your hotel profile on TripAdvisor, a list of providers or “partners” is provided underneath the “Show Prices” button. Bookassist has integrated with TripAdvisor to add your hotel website as a direct link on the list of providers. An additional feature of the show prices area is that it is always shown as a page banner even if the visitor scrolls down the page. Actual clicks are charged by TripAdvisor on a cost per click (CPC) model. To avoid being charged for multiple clicks, Tripadvisor will only charge for the first click in any 24 hour period that comes from the same identified visitor to their site. For existing Bookassist clients, Bookassist charges a single once-off set-up fee of €200 with no further management costs. This is by far the most competitive offering in the industry. Bookassist will report figures at the end of each month. The report will include details of the daily, weekly and monthly clicks for your property and the overall cost of the campaign. If you are not a Bookassist client, please contact us directly for pricing information. If you've listened to pronouncements and speeches made by Ministers or Chair or Directors of VisitScotland the word that is currently being used to describe Scottish Tourism is "resilience". Loose definition, "the ability to recover quickly from change or misfortune; buoyancy." "Cromlix House is one of the finest luxury hotels in Scotland. Whether it's business or pleasure, or a spur-of-the-moment romantic getaway, you will always experience a warm welcome, attentive yet discreet service and award-winning dining at Cromlix House. When you visit Scotland, you should visit one of its best country house hotels, the very definition of comfort, with a chapel that is an inspirational choice for weddings and two thousand acres of grounds that are an oasis of seclusion and tranquillity. Although it’s less than an hour’s drive from Edinburgh and Glasgow - Cromlix House is a world away. Well unfortunately, at least for now, it's a lot more than a World away and for the guests who were planning their stay it is a little inconvenient, for the employees who have lost their jobs it's a lot more. We understand that the hotel simply ceased trading at midday and that was that. But there are undoubtedly good businesses who are suffering due to lack of support from banks and who are not going to be able to ride the ever lengthening storm. There was much talk about a Tourism Bank but I've heard nothing of it since the Scottish election. There is little or no lending from banks to small and medium sized hospitality businesses of any great note (of course there are exceptions) to keep them afloat and it was suggested in last weekends papers that The Clydesdale Bank had been told to take a harder position with hospitality lending. Perhaps there is a need for public sector bodies to have a serious look at how resources can be best used. I remember the old call was Loans not Grants for students. Would we not be a lot better moving in the same direction for hospitality projects. By all means continue support funding initiatives and collaborations but facilitate by lending rather than underwriting with a no strings attached grant. Grants have spectacularly failed under any name to generate sustained tourism growth; a long list of publicly funded three year projects which have then failed to stand alone. Are there many still in existence beyond the period of public support? Surely shifting the onus to loans would move the funding into areas where there are likely to be greater levels of return for the sector as a whole and perhaps just provide the short and medium term assistance that genuinely good businesses may need to get through and prevent their doors closing. Cruise Passengers - Business Benefits For Fife? Lots of tourism related events planned for the next couple of months it seems. Here's one from The Dunfermline & West Fife Local Tourist Association who are organising a workshop with Scottish Enterprise and invite businesses to take part. According to the event notice there are 15,000 cruise ship passengers are arriving in Rosyth this summer and they are posing the question "What are you doing to capitalise on this opportunity?" A maximum of 40 places are available so be quick and don’t delay in booking your place. Aim: To inform and identify opportunities for local businesses to benefit from the Fife Cruise tourism market and explore ways to improve the cruise visitor experience. For further details download the attached document. I was off on holiday last week but found the following information in the Scottish Tourism Forum newsletter. It's not that it's news - we knew several weeks ago about the appointment but some of the additinoal information is interesting inclduing the fact that it is a four year contract. The other most interesting element is that the press release has only come out from New Minds and there is no mention (that I can find excepting Board Minutes) from VisitScotland about the major appointment. Nothing on the VisitScotland business website nor newsletters. Again maybe I've missed something! Anyway here's the annoucnement from New Minds about the new deal. "New Mind's Destination Management System (DMS) will power all of Scotland's official tourism websites following a major 4 year contract win with the national tourism organisation, VisitScotland. The win is the culmination of a rigorous tender process that has taken place over the last 9 months, which originally included 50 expressions of interest, whittled down to 12 tenders, and eventually shortlisted down to the final 3 contenders. One of VisitScotland's primary objectives as an organisation is to grow Scottish tourism through the digital environment. Central to this strategy is the requirement for a comprehensive Destination Management System which will act as a central repository for all data relating to Scotland's tourism offer. New Mind's technology has been selected as a 'best in class' platform to deliver these objectives, based on the strength of its functionality and flexibility. The existing http://www.visitscotland.com web site already receives 12.7 million unique visitors a year and the key aim for the future will be to increase this by improving online communication with both Scottish tourism businesses and consumers alike. The New Mind DMS will be central to that goal. Managing Director of New Mind, Richard Veal comments "We are very pleased to be working with such a high-profile organisation such as VisitScotland. This project will be one of the most significant pieces of work we have undertaken, and is our first project for a National Tourism Organisation, representing the interests of a whole country. We are very much looking forward to getting started on the project and are keen to bring our own unique set of skills and experience to the party." The project is scheduled to start by the end of the month, with a view to delivering the solution within the first quarter of 2012." Working as part of the Ryder Cup team and reporting to the Ryder Cup Project Director, you will be responsible for creating strong consumer PR strategies and delivering successful golf PR activity which will generate impactful consumer press and TV coverage about The 2014 Ryder Cup taking place in Scotland, and ongoing golf tourism to Scotland, in key consumer media around the world. You will work in close partnership with senior colleagues in the communications and marketing departments of both EventScotland and VisitScotland as well a large number of diverse external stakeholders including the golf industry, Ryder Cup Europe, Scottish Government, Scottish Enterprise/SDI, and Gleneagles. You will also be expected to liaise with all communications agencies employed by VisitScotland and EventScotland. You will be responsible for creating and delivering all consumer PR campaigns on behalf of EventScotland and VisitScotland around the world capitalising on planned golf, media and tourism events, as well as current affairs, to ensure a consistent core script of key messages is utilised in all media activity. Required activity also includes responding to all incoming press enquiries, creating and hosting press trips in Scotland, creating & managing press launches and managing / undertaking press interviews. Educated to degree level with communications qualification or equivalent. Extensive experience of working in PR (agency/in-house) at account director level. Experience of working in a PR/Communications environment at international sports / events level. Proven experience of objective setting and strategy implementation. The ability to successfully engage and lead a team of diverse partners and stakeholders towards a common goal. Experience of managing successful press launches & high profile press events. The ability to persuade and influence others. Experience of managing and reporting on a budget. Excellent networking and interpersonal skills. A golf handicap or competent sporting ability is desirable. A series of Forums has been announced by industry body Golf Tourism Scotland with a programme of golf industry seminars is to be held at venues across Scotland throughout February and the start of March. The five forums will feature guidance from some of the leading minds in the golf travel sector. Each seminar will explore opportunities for promoting golf clubs and golf-related businesses to international audiences and outline resources available to assist with researching potential markets and developing promotional activities. There will also be presentations from each region and updates about Golf Tourism Scotland itself. Golf Tourism Scotland (GTS) has led a delegation of Scottish golf businesses attending one of the world’s largest golf trade shows. With an impressive stand design featuring the Scotland The Home of Golf branding, Scotland’s representatives at The PGA Merchandise Show in Orlando, Florida enjoyed a successful three days promoting the country’s golf offering and attracting more golfing visitors from the USA. GTS was joined by 10 partner organisations representing a broad spectrum of Scotland’s golf industry, including golf resorts, tour operators, hotels and industry groups. The consortium was the largest ever assembled to represent Scotland at the annual PGA Show. As well as manning the prominent exhibition stand, delegates also attended a Scottish golf day prior to the show which attracted around 70 leading industry figures and golf journalists. The Scottish contingent included Andy Burgess, head of operations and development at Meldrum House, who picked up the 2011 GTS Gold Standard award for Hotel of the Year (country house hotel category).